The chamber ring forms the sides of the chamber and provides a way to see the mechanism in action. The gaskets (one of two shown) provide an air-tight seal. The ring is 3/8" x 1/8" sheet acrylic. The edges were polished. An over-length strip was heated in an oven and then bent around a cylinder. The ends were then cut and glued with CA using a small strip of thin fiberglass for reinforcement. The gasket was made of soft 1/32" sheet rubber. 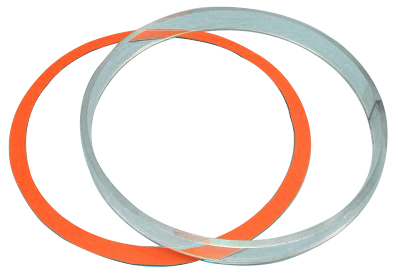 Alternatives: Large acrylic tubing can be cut to form the chamber ring but cutting the tubing can be difficult. A large o-ring can be used to seal the chamber but getting a good seal can be more difficult.